As we know bricks are rarely used building material now a days,Brick is obtained by moulding good clay into a block, which is dried and then burnt. This is the oldest building block to replace stone. Manufacture of brick started with hand moulding, sun drying and burning in clamps. A considerable amount of technological development has taken place with better knowledge about to properties of raw materials, better machinaries and improved techniques of moulding drying and burning. mortar joints, the size of these bricks are taken as 200 mm × 100 mm × 100 mm and 200 mm × 100 mm × 50 mm. However the old size of 8 (3''/ 4 )× 4(1′′/2)×2(5''/8) ″ giving a masonary size of 9″ × 4(1′′/2)× 3″ is still commonly used in India. (i) Building Bricks: These bricks are used for the construction of walls. (ii) Paving Bricks: These are vitrified bricks and are used as pavers. ( f ) Acid resistant bricks. (b) Facing Bricks: These bricks are used in the outer face of masonry. Once these bricks are provided, plastering is not required. The standard size of these bricks are 190 × 90 × 90 mm or 190 × 90 × 40 mm. (c) Perforated Building Bricks: These bricks are manufactured with area of perforation of 30 to 45 per cent. The area of each perforation should not exceed 500 mm2. The perforation should be uniformly distributed over the surface. They are manufactured in the size 190 × 190 × 90 mm and 290 × 90 × 90 mm. insulation to buildings. They are manufactured in the sizes 190 × 190 × 90 mm, 290 × 90 × 90 mm and 290 × 140 × 90 mm. 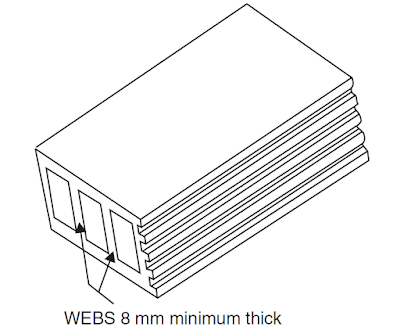 The thickness of any shell should not be less than 11 mm and that of any web not less than 8 mm. should not be more than 10 per cent. iron content, flint or sand and vitrified at high temperature in a ceramic kiln. (i) Colour: Colour should be uniform and bright. (ii) Shape: Bricks should have plane faces. They should have sharp and true right angled corners. (iv) Texture: They should possess fine, dense and uniform texture. They should not possess fissures, cavities, loose grit and unburnt lime. (v) Soundness: When struck with hammer or with another brick, it should produce metallic sound. (vi) Hardness: Finger scratching should not produce any impression on the brick. not be more than 20 per cent by weight. For class-I works this limit is 15 per cent. and potassium. They keep the masonry permanently in damp and wet conditions. (x) Thermal Conductivity: Bricks should have low thermal conductivity, so that buildings built with them are cool in summer and warm in winter. bricks provide good sound insulation. steel columns to protect them from fire. brick is filled flush with 1:3 cement mortar and the specimen is stored in damp jute bag for 24 hours and then immersed in clean water for 24 hours. The specimen is placed in compression testing machine with 6 mm plywood on top and bottom of it to get uniform load on the specimen. Then load is applied axially at a uniform rate of 14 N/mm2 . The crushing load is noted. Then the crushing strength is the ratio of crushing load to the area of brick loaded. Average of five specimen is taken as the crushing strength. wet condition is determined. The difference in weight indicate the water absorbed. Then the percentage absorption is the ratio of water absorbed to dry weight multiplied by 100. The average of five specimen is taken. This value should not exceed 20 per cent. along the width and then along the height. 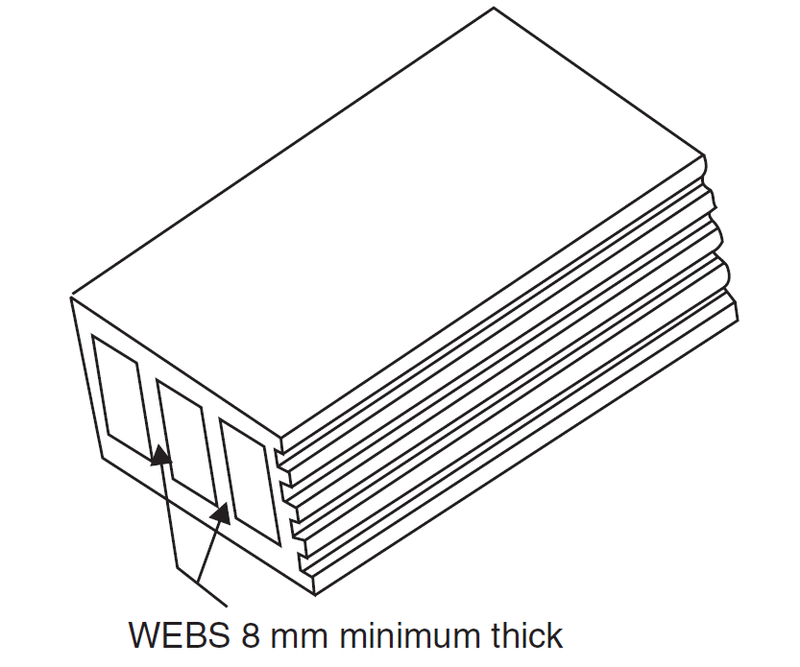 For the standard bricks of size 190 mm × 90 mm × 90 mm. Heightwise: 1740 to 1860 mm. (i) Uniformity in Size: A good brick should have rectangular plane surface and uniform in size. This check is made in the field by observation. observation may be made before purchasing the brick. section should be homogeneous, compact and free from defects such as holes and lumps. (iv) Sound Test: If two bricks are struck with each other they should produce clear ringing sound. The sound should not be dull. (c) Moderate: 10 to 50% area covered with deposit but unaccompanied by flaking of the surface. (e) Serious: Heavy deposits of salt accompanied by flaking of the surface. 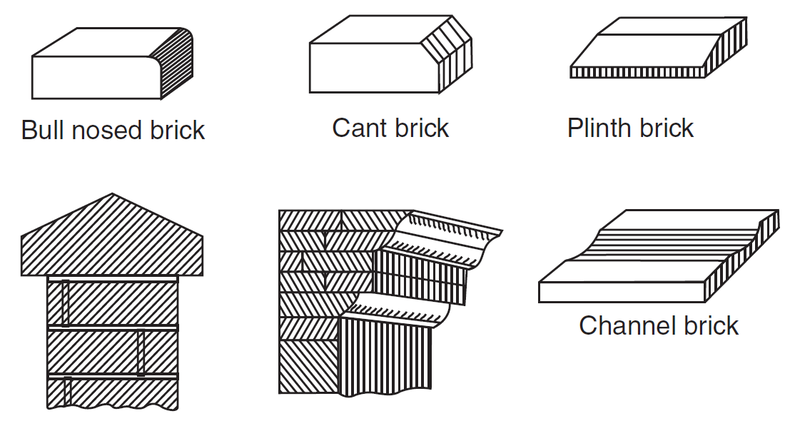 (i) First Class Bricks: These bricks are of standard shape and size. They are burnt in kilns. They fulfill all desirable properties of bricks. construction of walls which are going to be plastered. irregular. They are used as aggregates for concrete in foundations, floors and roads. (ii) For lining of ovens, furnaces and chimneys. (iii) For protecting steel columns from fire. (iv) As aggregates in providing water proofing to R.C.C. roofs. (v) For pavers for footpaths and cycle tracks. (vi) For lining sewer lines.